Here in the low country of South Carolina, our trees do not rush to change their leaves to the colors of orange, yellow, red, burgundy and purple we so love in Autumn. For that matter, Mother Nature doesn't abruptly turn the temperature down either! Telltale signs that the hot, humid days of summer are finally going to come to a close revolve around the shortening of daylight, the observation of Hickory and Oak tree's bounty of fruit, Beautyberry and Sparkleberry bush's berry colors changing from green to magenta and black respectively, Devil's Walking Stick tree and Poke Weed fruit formation, and best of all, the color change of the cord grass in the salt marsh. Now that the Autumnal Equinox is upon us, what changes are you noticing in your neck of the woods? 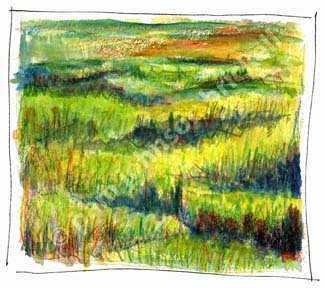 In the above plein air sketch, I used Derwent watercolor pencils in an AquaBee Super Deluxe Sketchbook. It may have taken all of 10 minutes, but as I painted the below canvas in my studio, I could still feel the warm morning air and recall the smell of the pluff mud where the Great Egrets, Wood Storks and Ibis love to dine. Pam - both of these are gorgeous! Isn't it funny how sometimes those quick sketches capture such energy? I'm noticing changes in grass colors, too. Even though temperatures here in Southwest Florida are still hot and humid, there are hints that change is in the air. A bit less humidity at times, more bird activity, and squirrels feasting on acorns and pine cones. I see more of late summer's fruits: beautyberry (like you! ), coco plum, sea grape, marlberry,and more! Does the sky change color up there? Our Florida skies seem to have a touch more violet in them now - and I always think of summer skies as having a bit of turquoise, they look warmer somehow. Love the energy in the sketch and that it vibrates through the painting as well! As Elizabeth mentions, Fall is more tentative here with just a few peeks of what is to come. Thanks, Laure! The peeks are such a tease but feel soooo good :) I truly enjoy the length of autumn in the south. No sense rushing into winter! Both of these are beautiful, Pam! For us here it's the light - lower in the late afternoon streaming warmly in through the trees around the deck and into the kitchen window - and the goldfinches are bulking up at the feeder - sometimes a dozen at a time - getting ready for their fall journey away from us. The nuthatches are back, too - love those crazy upside down birds! Thank you, Rhonda! Ooo I love the late afternoon sunlight when it streams in the windows :) Your feeders must be beautiful with all the finches. I love the antics of nuthatches. When we lived in NY the ones that frequented our feeder would follow me when I walked the dogs - letting me know I was shirking my feeder filling duties! 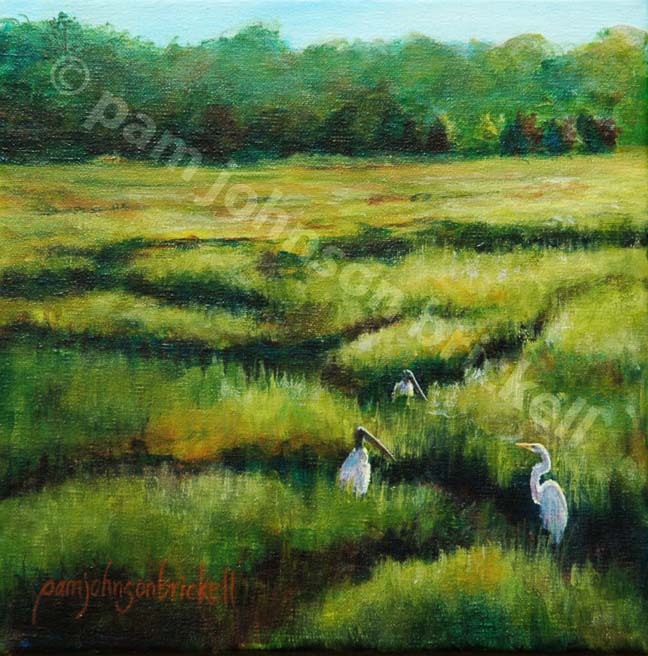 Love how you captured the wood storks and the ibis in the second painting...and the spontaneity in the first. Love both versions...each has it's own unique and pleasing qualities! Is the second one a watercolor on canvas board, an acrylic or oil? Thanks, Debo! The second is acrylic on a 10"x 10" canvas with 1.5" sides so I continued the painting around the edges. You did a great job creating the illusion of depth! I love reading you descriptions almost as much as I love seeing your sketches!